This National Volunteer Week, we are celebrating the incredible people who are such a vital part of the work we do. Because of these passionate individuals, we can end homelessness for even more people—and provide more personalized support to help build wellbeing. Linda Jo and Mr. Moin are two longtime volunteers who have truly made their marks, and we are honored to share a little bit about their valuable work with us! Linda Jo Kuc began volunteering in the Community Kitchen five years ago when a friend encouraged her to try it. “My first thought was to not do it weekly, but after a couple of weeks I was hooked!” she says. She quickly became a key player in the Kitchen as part of the Tuesday “Dream Team” volunteer crew. “The Tuesday group consists of truly great people that are delightful to spend time with and feel a bit like family. Before long my entire week would center around Tuesdays! As a retiree I often don’t know what day of the week it is…but I know Tuesdays!” she says. As an experienced Culinary Volunteer, not only does Linda Jo help with preparing and serving meals, she is also a leader for newer volunteers. She provides instructions, assigns tasks, and shows volunteers where to find what. Her work has included everything from preparing and serving meals, to cleaning the windows, to washing aprons, and more. She even donated a new washing machine when the one in the Community Kitchen broke down. After many years in Austin, she now looks forward to leaving the city for a more peaceful life in the country. 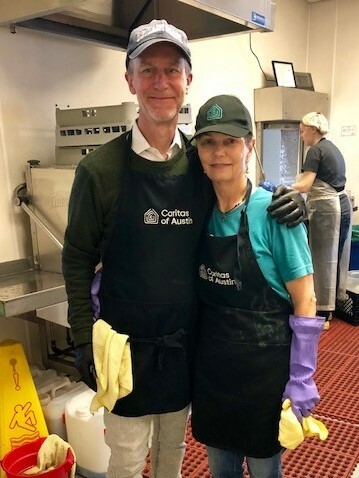 Linda Jo has brought immense joy, compassion, and hard work to the Community Kitchen for the past five years, and has our deepest gratitude for her years of service! Mr. Moinuddin Ahmed “Mr. Moin” has been an incredible supporter in our day-to-day services to the people we serve, working behind the scenes with Case Managers to find employment opportunities. He began volunteering with the Employment Program several years ago. “After retiring in California we moved to Austin where our sons were living. I talked to my children that I want to remain busy and contribute to the community. 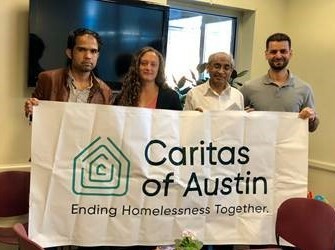 They suggested a few organizations, including Caritas of Austin to volunteer,” says Mr. Moin. “I have enjoyed almost five years of my association with Caritas. All the case managers I have worked with were true professionals who really cared for their clients and also made me feel valuable. I got the satisfaction of helping refugees, directly or indirectly, in finding jobs and making their transition to their new country easier,” says Mr. Moin. Mike Kakarash, Employment Program Manager, shares that Mr. Moin’s service to the program has been invaluable over the past several years: “His commitment only grows when the challenges seem insurmountable. Mr. Moin has been a dedicated, punctual, and detail-oriented, thus very valuable, volunteer.” Thank you, Mr. Moin, for everything you have done to serve Caritas clients over the years. We truly appreciate your support!